The Chinese have been parading off the Alaska coast as well as in Beijing for their victory celebrations: The first ever sighting of Chinese warships in the Bering Sea, which has left the Pentagon puzzled, came as US President Barack Obama visited the state. The five warships sighted by the US in the waters off Alaska coast have “started their return transit," US Chief of Naval Operations Admiral Jonathan Greenert told Reuters on Thursday. He added that they “weren't that far away with an exercise” when they were spotted sailing in the international waters of the Bering Sea on Wednesday. US officials said they have been tracking the movements of the five ships – reportedly three surface warfare ships, one amphibious assault ship and one supply vessel. The Pentagon said the incident was the first time the US had seen Chinese navy ships off Alaska coast. “We respect the freedom of all nations to operate military vessels in international waters in accordance with international law,” said Pentagon spokesman Capt. Jeff Davis on Wednesday. Defense officials "have not detected any sort of threat or threatening activities,” said White House spokesman Josh Earnest on Wednesday. However he added that Washington was puzzled as "the intent of this is still unclear." On Thursday China's Defence Ministry said that the naval ships had been carrying out routine drills. China’s excursion into the Bering Sea backs Beijing’s aspirations of consolidating itself as a ‘blue water’ naval power. 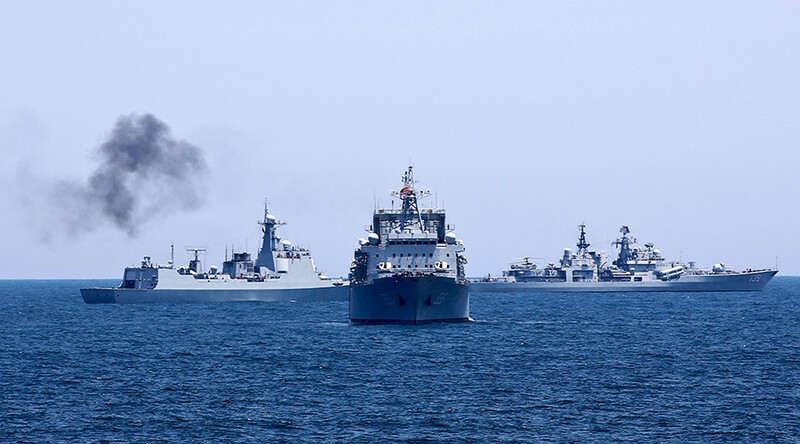 Military observers believe China’s improving naval capabilities may pose a challenge to the US in the Western Pacific, said US specialist in naval affairs at the Congressional Research Service, Ronald O'Rourke in a July report. “Observers of Chinese and US military forces view China’s improving naval capabilities as posing a potential challenge in the Western Pacific to the US Navy’s ability to achieve and maintain control of blue-water ocean areas in wartime—the first such challenge the US Navy has faced since the end of the Cold War,” he wrote. The ships’ visit to the Bering coincided with Obama’s tour of Alaska as well as a massive military parade marking 70th V-Day anniversary in Beijing on Wednesday. US ships are a more regular sight near Chinese shores. So far this year, the US has conducted several joint exercises with naval powers which border the disputed South China Sea. These include Indonesia, Vietnam, Malaysia, the Philippines and Singapore. In Addition, the US Pacific fleet annually conducts more ambitious exercises under the Cooperation Afloat Readiness and Training (CARAT) with the participation of several member nations of ASEAN in Southeast Asia.